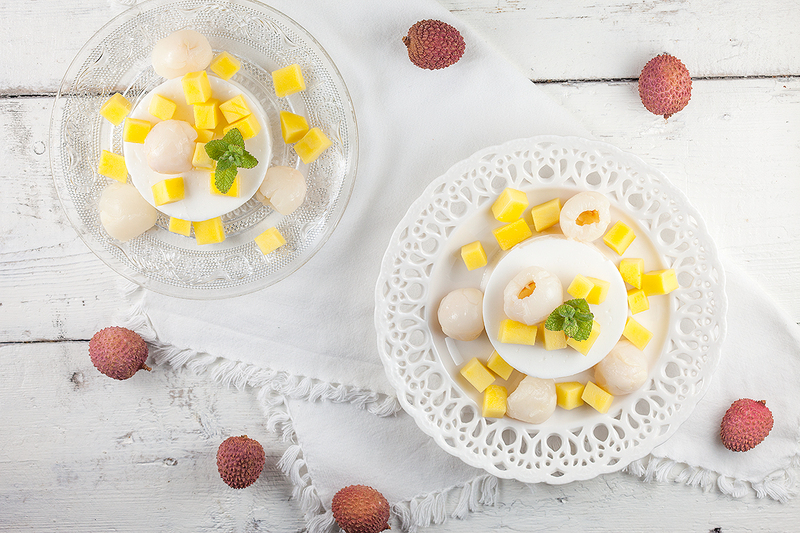 ADD the canned lychee to a colander and collect the syrup in a bowl. Use 325 ml of the syrup and heat it up in a small saucepan along with 75 gram sugar. As soon as the sugar has dissolved you can STIR in the agar agar. Let it cook on low heat for a few minutes before you also stir in the coconut cream. Let the mixture cool off slightly while you coat the ramekins with a thin layer of neutral oil. 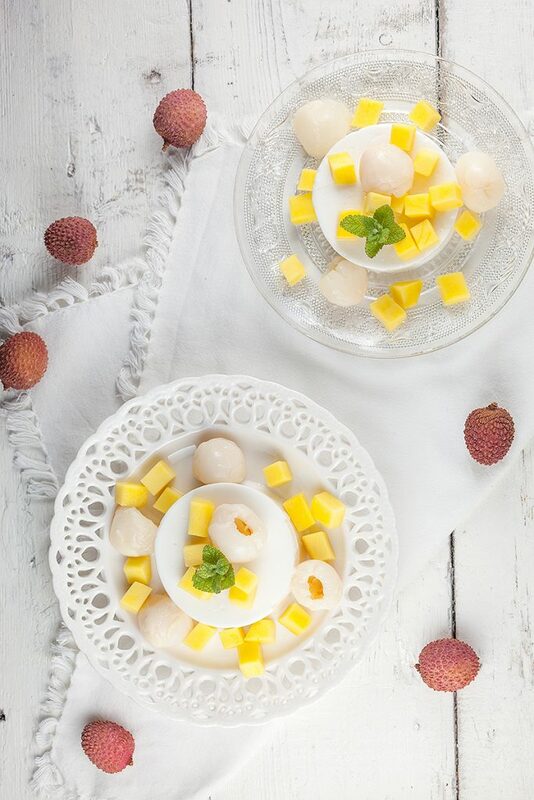 DIVIDE the lychee-coconut mixture evenly over the ramekins and refrigerate for at least 2 hours. PEEL the mangos and chop them into cubes. 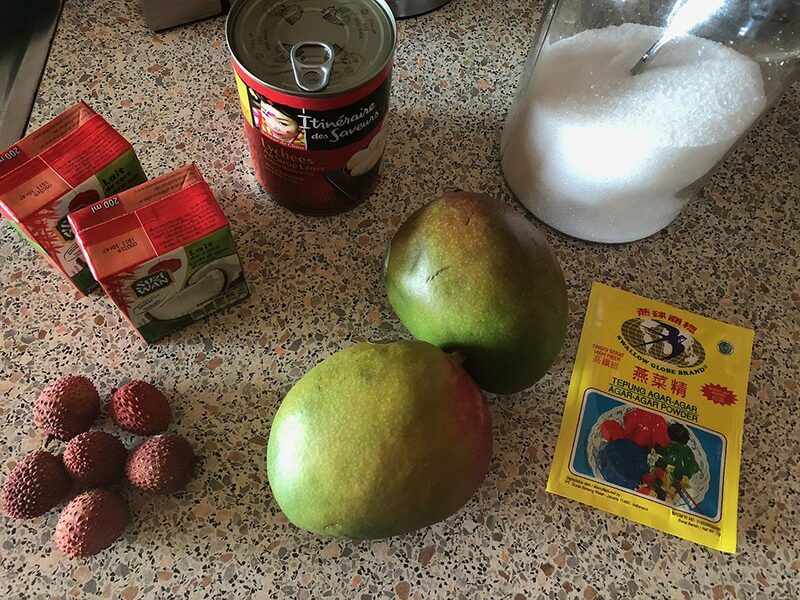 If you like you can also chop the lychee into halves. FILL a small bowl with warm water and immerse the bottom of the ramekins into the water. RUN a small knife around the pudding, this way the pudding will easily unmold from the ramekins. 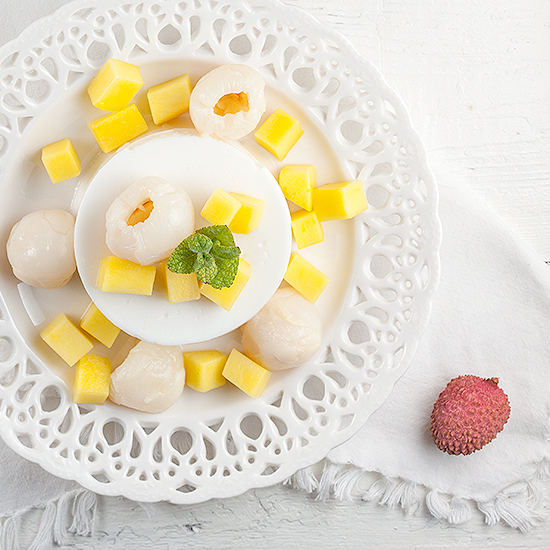 DIVIDE the mango and lychee over the pudding. Because of the creamy pudding and soft fruit it’s not necessary to serve this dessert with a sauce. Enjoy! How much is 3/4 of a sachet in ounces? I purchased agar agar but it was only available in a 4oz packet. Thank you! Hi Nina, the sachets contain 7 gram agar agar. So 3/4th is about 5 gram, which is about 0.18 oz according to google. I’m not familiair with ounces, so I hope it’s correct.